for C.B.S.E Public School Teachers PGT , TGT , PRT , PET , Jobs. For these jobs you can apply with in 5 days from the notification date. 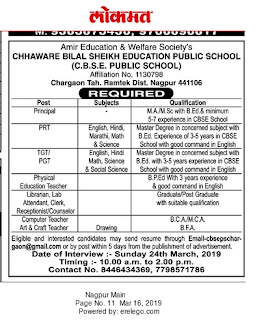 Interested candidates can attach the Updated Resume and all Educational Certificate copies with Recent Passport size Photograph and send it to the given Postal address or EMail id are given below. Refer the official website http://www.cbsepschargaon.org/ for more Details. They conducted the interview on 24th March 2019. Interview slot is 10 AM TO 2 PM. Salary, Application Procedure, Qualification, Email-id, Postal address details are given below. Chhaware Bilal Sheikh Education Public School. Ending Date to apply: With in 5 days from the notification date. As Per the School Norms.